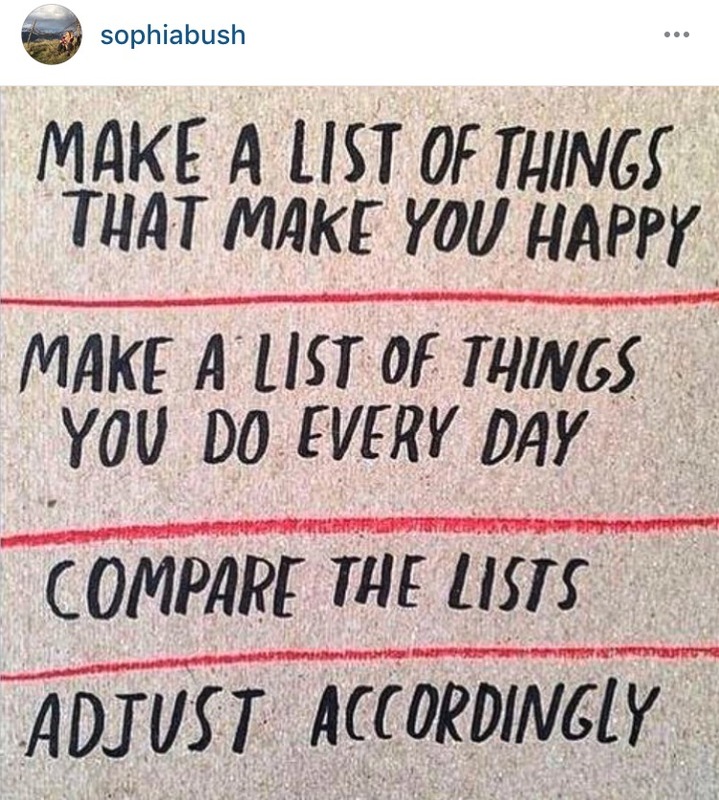 Dear Sophia Bush, thank you for the motivational meme this morning, needed it. Step 1: "Make a list of things that make you happy." I did this today. Get out a pen and paper, and sit in peace. Truly think about what things make you happy and write them all down. I wrote 7 things down that make me happy. Not just ordinary happy either, but that happy that gives you that giddy 5 year old feeling. Write down what leaves an endless smile on your face. Step 2: Make a list of things you do everyday. So on another piece of paper I started to think of my day to day routines. I planned out two days. I started to jot down my schedule by hour slots to get a real look to see what my days are really made of. As I was writing my list of things that I do daily I started to realize how boring my days seemed to be. My day to day seemed be looking extremely monotonous. Immediately, I started to compare! Step 3: Compare the lists. Put each paper side by side. Look at your everyday and analyze how much of your happiness is included in your daily routine. Do you have any commonalities with your list? Do you have as much happy in your daily routine, as your sheet of happiness brings? I hope you do! I hope your everyday is full of happiness. But to be honest, I found that my daily routine was lacking the things that made me happy. Little things, such as playing basketball or working out in the morning make me happy, but they weren't on my list of everyday things. Then that "ah-Haaaa" momement occurred. Why don't we do more things that make us happy? It's time for a change baby! It's time to do more of what makes you happy! It's time make some adjustments in life. If your happy sheet did not share commonalities with your everyday routine, let's try and make some adjustments and add some happy days to your daily routine. I challenge you to do one thing that makes you happy this week, that was not on your original day to day routine and see what a different it makes. After you do your act of happiness, remember that feeling of happiness and let it remind you to keep doing what you love. Add those little pieces of happiness to your life more and more until your happy sheet is similar to your everyday routine. Why? Because you deserve it!